The Lincolnshire village of Mareham-le-Fen lies strung out along the A155 road between Spilsby and Coningsby. Gosling was the local garage proprietor, trading as T H Gosling & Son. Founded in 1922 the firm also ran a modest number of bus services to the three nearby market towns of Horncastle, Boston and Spilsby; all departing from the Royal Oak in Mareham. Their timetables were conceived to meet the needs of shoppers and market-goers, but Gosling did not have the routes to themselves as Road Car service 15 also ran seven days a week from Horncastle through Mareham-le-Fen and Revesby to Boston. Amongst the early vehicles was one supplied new to them, FW2378, a 1931 Bedford WLG with Rainforth B20F body. Eric Bawden notes that Gosling can lay claim to possibly being the very first operator of a Bedford PSV as they took delivery of Bedford WLG (goods chassis) FW 2378 with Rainforth body in 1931 before the WLB (bus) chassis actually went into production. It stayed in their fleet until about 1947 when it left the road and ended up in a ditch with a twisted chassis frame amongst other damage. But it was recovered and put into store where it remained until the 1970s when it was purchased by the late Nick Lord who carried out a ground up restoration, including stripping it back to a bare chassis and having the frames straightened. It was then rallied in the original Gosling livery by Nick until his untimely passing in his mid forties. It is currently preserved as an exhibit at the Lincolnshire Aviation Centre, East Kirkby - a village that the bus would once have served. Whilst in preservation it was was photographed at Brighton in 2004. A later vehicle was Leyland Tiger PS1 half cab FBE865. Another known vehicle in the fleet in 1955 was Leyland CPO1 Comet GBE81, with Rainforth C32F body; delivered in 1949 and sold in March 1960. Coincidentally the only other Comet built with a Rainforth body was just down the road with Fenwick of Old Bolingbroke. Gosling had had three earlier vehicles with Rainforth bodies - a Chevrolet in 1930, a Dodge in 1935 and a Leyland PS1/1 in 1948. 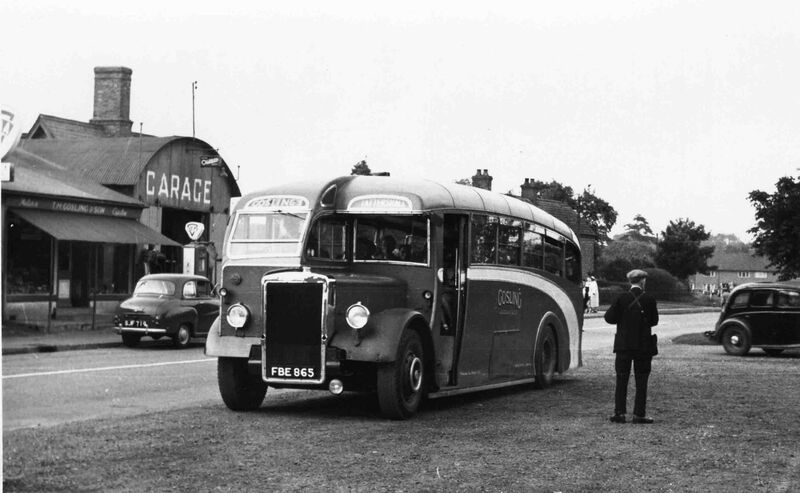 A post-war picture of unknown date below, possibly mid-1950s, from the excellent village website shows six of their coaches and buses on the garage forecourt (the Comet is fourth from the left). The founder, Thomas Henry Gosling, died in 1947 at the age of 77 years. 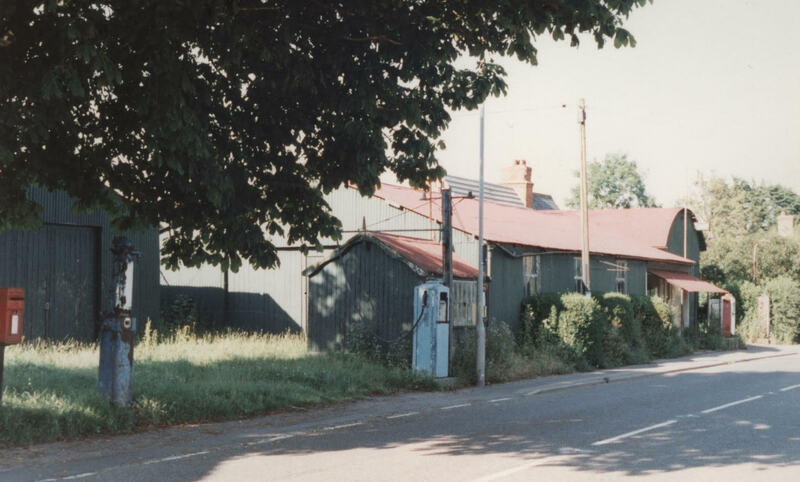 The Gosling garage and car dealership business continued into the 21st century - a 2006 view of the garage is here - but the site now appears abandoned. 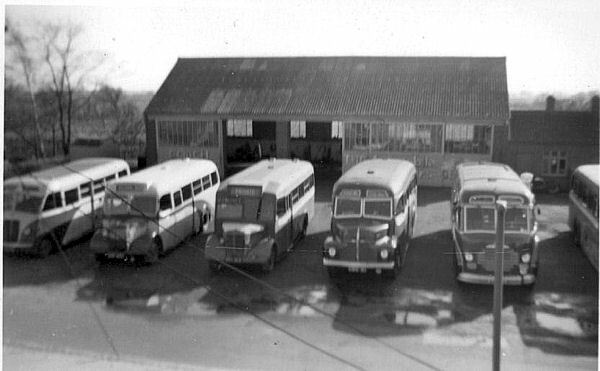 The bus routes and two Leyland PS1/1 of the then fleet of six vehicles (three buses and three coaches) had passed to H H Milson (founded 1923) of nearby Coningsby in March 1960. They operated their local services using a fleet of maroon, red and cream liveried buses and coaches. In time the Milson business and nine vehicles and the bus routes were bought in 1979 by Hogg's of Boston (founded in 1959 and who had earlier purchased the Sharp business). Hogg's were purchased by Brylaine Travel of Boston in 1990 and they continue to operate through Mareham-le-Fen on their Horncastle - Boston service from their out-station depot (ex-Milson) at Coningsby. 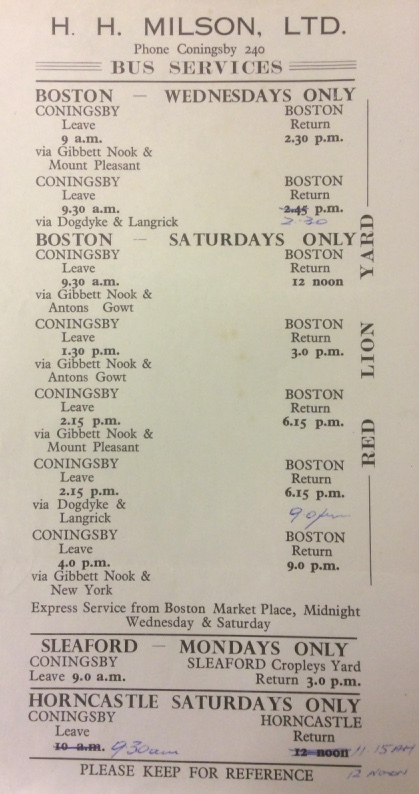 A recently discovered timetable dated February 1935 (poor quality does not permit reproduction here) shows a modest expansion of routes compared to the 1933 timetable above. On the Monday route to Spilsby one journey is extended back from Mareham to run to and from Tumby Woodside. A Monday evening picture bus runs from Mareham to Woodhall Spa - this must have been short-lived as it is already marked as cancelled on the timetable. One of the Wednesday market journeys to Boston goes via Tumby Woodside instead of Revesby. The road via Revesby has six Wednesday journeys and seven on Saturday to Boston. Horncastle has five buses on a Saturday, three of which run through to and from Boston. A new daily summertime route links Tattershall, Mareham and Spilsby to Skegness twice a day from May to September. On Wednesday and Saturday there are four journeys on this route and one journey is extended from Skegness to Mablethorpe. 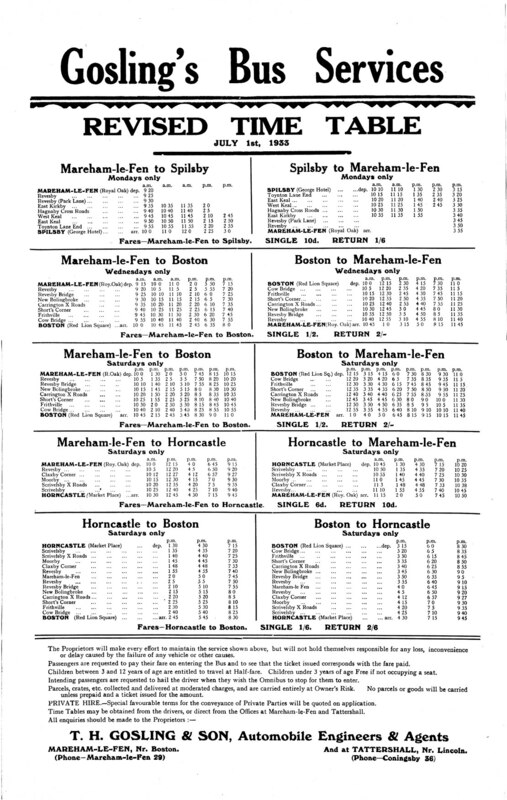 The timetable from September 1943 showed little change over the 1933 timetable illustrated above except for the second route to Boston via Tumby Woodside on Wednesday; and a reduction in the number of journeys to Boston on the original route from Mareham via Revesby (from six to five on Wednesday and from seven to five on Saturday). It is known that the Skegness service was suspended during the war with anticipated reintroduction in 1946. 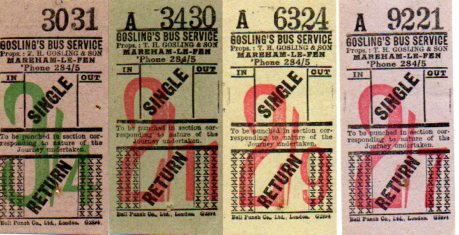 The latest timetable from June 1959 (probably the last one issued by Gosling's) again showed only modest change (in fact surprisingly little change over the 26 years since the 1933 timetable illustrated above). The Wednesday service to Boston via Revesby reduced from five to four journeys but a Wednesday service introduced on the alternate route via Tumby Woodside. On Saturday the Revesby route restored to 1933 levels, increased from five to seven journeys again. The Monday route to Spilsby appears to have gone, but this does appear to have been reinstated after the Milson takeover. An undated (but pre-1960) timetable for Milson's routes. Other Milson's timetables can be found here. magazine of the LVVS. Any further information always welcomed!